To allow more participants in Les Houches there will be two 10-day sessions. The first session is from 10 to 19 June 2019. The second session will take over from 19 to 28 June 2019. See here for the working groups schedule. The detailed programme of each session in Les Houches builds up on a daily basis. The total fee covers lodging (single room) and meals (breakfast, lunch and dinner). It amounts to 950 Euros for a 10 day period. This fee should be made payable to the Secretariat in Les Houches upon arrival. Payment can be made by: Cash in Euros, French cheques in Euros, Visa and MasterCard. Note that American Express, Diners Club and JCB are not accepted! The fee can also be paid in advance through a purchase order issued by the participant institution (for European labs, please provide the VAT number and the exct address of the lab.) The purchase order must be sent to the address of the School. Some nationals require a visa for France. This is delivered as a Schengen visa. Note that if you are travelling from another Schengen country to France you will be permitted to enter France provided your visa is valid during the whole period of your stay. The situation with Switzerland joining the Schengen protocol has changed for the better. A Schengen visa will allow you to enter Switzerland. Likewise Swiss authorities also issue Schengen visas. A valid Schengen visa allows to stay in both France and Switzerland. If you require a visa, please indicate so when you register so that we can send you appropriate invitation letters. We also urge you to apply for visas at least two months in advance. +33 6 87 82 87 83 from outside France or 06 87 82 87 83 within France. More emergency numbers will be listed on the wiki. 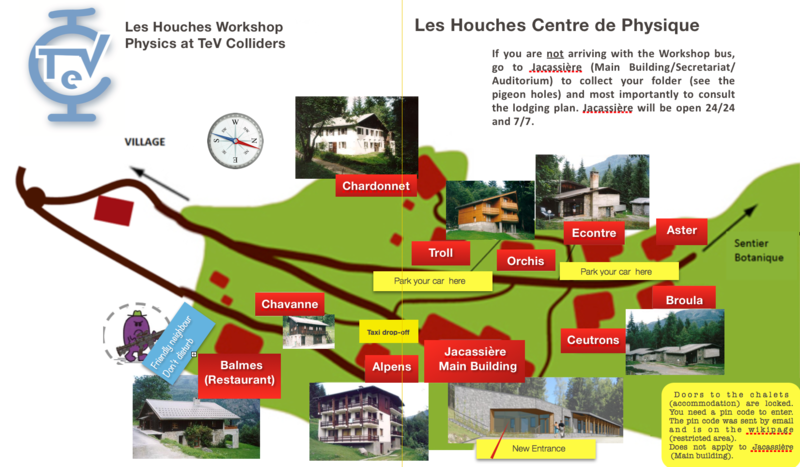 Participants will be staying at the Centre, Ecole de Physique des Houches. Meals are taken at the restaurant building (Les Balmes). Drinks are not included. Coffee, tea (free!) and liqueurs are available at the cafeteria. Breakfast: 7:45 to 8:45; Lunch: 12:30; Dinner: 19:30. Participants are housed in "chalets". All the buildings have been renovated recently. Most rooms are single occupancy. The cafeteria has a piano, table soccer and table tennis. A few mountain bikes are available. Here are pictures of the Housing and Conference complex at Les Houches. Weather is unpredictable (altitude 1150 m), temperature may range from -15 to 5°C in winter and from 5 to 25°C in summer. Sport clothes are preferable. Warm sweater(s), rain gear and good walking shoes are necessary. Shoes such as slippers for indoor use could also be useful. Note that we will most probably organise some excursions. If it is sunny and we are hiking it is strongly recommended that you bring sunglasses and skin cream/sun block. Albeit generally warm in June, we recommend that you bring some warm clothes: it can get chilly in the evenings. Considering how dreadful the weather has been all over France this Spring, warm clothes for Les Houches are a necessity in Les Houches. A flashlight is handy at night; the school chalets are scattered on the mountainside and outside lights may be poor (power failures, storms,..). Electricity: AC, 50Hz, 220V. Bring an electric plug adaptor for your laptop and other electric equipments. Telephone: there is GSM and 3G/4G coverage. For this section and the following, please consult the wikipage (restricted access) for up-to-date information. Session 1 participants can not arrive at the Centre before 16.30 on Monday 10 June. Session 2 participants can not arrive before 16.30 on Wednesday 19 June. This applies whatever means of transport you are using to reach the Centre. It is a good idea to download/print the map, or better the leaflet (leaflet for session 1 / leaflet for session 2) of the Centre with you especially if you are not taking the Conference bus. The map indicates the location of the various buildings including the chalets you will be sleeping in. The room/chalet allocation will be available a few days before the start of the workshop as downloads are through the wiki, make a note of your chalet and room number. You will need the pin code to enter the chalet. The list of pin codes will also be accessible on the wiki (restricted access), make a note of the code for your chalet. We recommend that you save the pin code to your chalet in your phone contacts, together with the name of the Chalet and Room number. Only those who are registered to take the conference bus will be able to board the bus. Registration for the bus is to be made on the wiki. This page is only accessible to the participants. The reason we are reverting to this method is that in the past many participants kept changing their mind about the bus, many asking for a change at the last minute after finding out that a colleague may be going by car or that the colleague did no longer have a car..... Updating this info through emails, a few times for the same user sometimes, is a lot of work. One or two of the organisers will be at the meeting point at CERN. Make sure you are not late. The bus will not wait long. Conference Bus: CERN <-> Les Houches (Centre de Physique). The bus journey from CERN to Les Houches takes about 1h40. Departure from CERN: Monday 10 June 2019 at 16:00, Main Entrance B. Departure from Les Houches: Wednesday 19 June 2019 at 13:30. Departure from CERN: Wednesday 19 June 2019 at 16:00, Main Entrance B. Departure from Les Houches: Friday 28 June 2019 at 13:30. Once the bus arrives at the Centre we will distribute a map, or better the leaflet (leaflet for session 1 / leaflet for session 2) that will indicate the location of the room and chalet you will be sleeping in. You can also download/print the map. The room/chalet allocation will be available as downloads are through the wiki, make a note of your chalet and room number. You will need the pin code to enter the chalet. The list of pin codes will be found on the wiki (restricted access), make a note of the code for your chalet. Note that on Wed 19 and Friday 28 the bus from Les Houches to CERN will first stop at Geneva Airport before continuing to CERN. This is not only very useful for those taking a plane but also those taking a train. If you have a train to catch on those days it is advisable to start your train journey from Geneva Airport rather than Cornavin (Geneva Main Train Station). You will save time not taking the bus/tram from CERN to Cornavin. From Geneva centre (main bus station) to the Les Houches Village. Take the bus going to Chamonix and get off at the stop Office du Tourisme (tourist centre) of Les Houches. Note that this bus starts from Geneva Airport before continuing to Geneva centre, and then to the Chamonix Valley (les Houches). Note however that this service is not convenient. First it is not frequent. Second, the bus stops in the village which is still 5 km away from the School. If you do not want to climb on foot, we advise you to take a taxi from Les Houches village. Fare: about 15 Euros. To go from Geneva train station to the bus station, see here. For a map of Geneva and general information, go here. Once you arrive at the School, go to the Secretariat in the Chalet Cécile DeWitt (previously Jacassière) or just look for your pigeon hole in the lobby. In the main building, there will be a list indicating your room (Lodging Plan). You still need the pincode to enter the chalet. The pincodes will be on the wiki (restricted access). We will also send the list of pincodes by email a couple of days before the meeting. Bring this map, or better the leaflet (leaflet for session 1 / leaflet for session 2), with you or save it on your phone. If you are not taking the Conferene bus, this is the most practical way to get to the Centre. Geneva Airport is 1 hour drive from les Houches. There is a regular bus service between Geneva Centre and Les Houches (see section Local Buses from Geneva). The simplest way is to use a shuttle service (approximately 40 euros up to the School, book at least three days in advance). If you already have your return date, we would recommend to book a return trip. Click here for a complete view of the different companies. Beware: The Ecole des Houches does not recommend the Alpybus company since this company will only take you to the village des Houches which is 5 km away from the Centre. NB: You can have a discount with the company Mountain Drop-Offs: MDO discount. Mountain Drop-Offs transfer desk at Geneva Airport, here. You could also rent a car from Geneva Airport. Arrival at Les Houches station is through at least one change at Saint-Gervais (from France) or at Martigny (from Switzerland). There are about 10 trains per day between St Gervais and Les Houches. If you are coming from Geneva we strongly advise you not to take the train too many changes. Les Houches train station is about 5 km from the Centre de Physique (the latter being uphill!!). If you do not want to climb on foot, we advise you to take a taxi. See tips on taxi in the above section on "Local Buses from Geneva". For other fares, updated train timetables and reservations, you can consult the French Railways site. Les Houches are easily accessible from France (A41 highway), from Switzerland (Martigny and Col des Montets). From Geneva and Le Fayet: 8 km before Chamonix, 300 m after passing under a tunnel, bear right by the first road out for "Les Houches Les Trabets". When arriving at the cable car station "Bellevue", turn right and continue upwards (roughly 2 km starting from the cable car). You will reach a small roundabout, near a second cable car station, named the "Prarion". Turn left and follow the sign "Ecole de Physique". Go uphill till the Route de la Côte des Chavants where you will have to make a sharp (right) turn (there is a sign for Ecole des Houches/Centre de Physique). You should then drive almost all the way up the Côte des Chavants and follow Parking Visiteurs. From Chamonix: bear right for "Les Houches-Chef-Lieu", turn right in Les Houches, go ahead at the cable car station "Bellevue". Then proceed as above. Cars may be rented from Geneva and from Chamonix, but it is useful to make a reservation well in advance. Once you arrive in the Centre, please park your car in the "visitors' car park" then walk down (or take the stairs) to the main buiding. Bring this map with you. The Secretariat is in the Chalet Jacassière. You can also just look for your pigeonhole in the lobby of Jacassière. There will be a list indicating your room.